Here is an excellent resource from ReadWriteThink to help students with their writing. 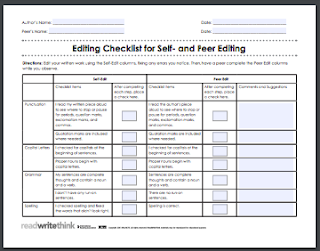 Editing Checklist for Self and Peer Editing is a tool that allows your students to edit their writing along a number of predetermined set of criteria. They can also use it to peer-edit their peers writing. The checklist is designed in such a way to raise students awareness of writing conventions and therefore enhance their writing style. More specifically, using the Editing Checklist, students will be able to assess their writing against four main criteria: punctuation, capital letters, grammar, and spelling. However, this Editing Checklist is best used after students have already gone through the revision stage in their writing process. 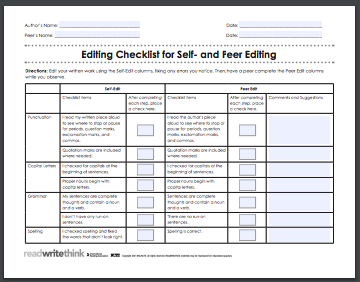 Check out this page for ideas and tips on how to use Editing Checklist for Self and Peer Editing with your students.